The history of water hyacinth may have started on December 16, 1884 here in the United States, but its history really began in the Amazon basin where its native habitat is. By the late 1800’s water hyacinth had made its way not only to the US, but also to Europe and Africa where, as with the US, it was quickly becoming a problem in the water ways. Economies were affected and habitats lost in all of these areas, quickly after introduction of the species. These days water hyacinth is well known in the water gardening world as a popular, beginner level, easy to care for, inexpensive, floating plant. Often touted as being a water purifier and a solution to green water issues that many pond owners experience. The water hyacinth is a nice looking plant above water with its large bulbous thick green leaves and beautiful flower; below water the plant sports some huge roots. The roots are a blackish coloration and can grow in excess of 12” long; these roots are often utilized by fish fry and various aquatic bugs as habitat. The roots absorb impurities, and can lock up floating particles from the water, thereby “purifying” the water. The roots are also picked at by fish, and shed by the plant in quantity. As an aquatic plant enthusiast this plant is so easy to love. However as a responsible water gardener these plants may raise some concerns. Water hyacinth is not a very welcome plant in many places outside of your water garden. With the “dirty” nature of these plants, you may not welcome them into your water garden! Those amazing roots that “clean” your water and get rid of algae, also make your pond pretty dirty by clogging filter pads, littering the bottom, blocking skimmers, burning out pumps, causing leaks, and increasing maintenance to almost nightmare levels. Not to mention their abillty to quickly cover the entire surface of your pond, again and again. Water hyacinth is the worlds fastest growing plant! It chokes waterways costing hundreds of millions in removal efforts around the world, greatly affecting local economies and trade routes. It chokes out native habitats, ecologies, and species. It spreads by wind, floods, birds, boats, and humans. It impedes passage of large and small vessels in waterways, by creating impenetrable floating mats. Given these “did you knows”, and understanding how it can really impact your koi pond or water garden, we can agree it may not be the ideal water garden plant regardless of its current popularity. At least not for the water gardening “hobbyist”. Probably the best use for the water hyacinth is in small controlled container type water gardens, patio ponds, and other very controlled displays. However, let’s not leave this plant completely demonized! There is a bright side to this plant as well, if it is cultivated and managed correctly. There are some very interesting uses and possibilities for the worlds fastest growing noxious invasive plant! The flowers are used to create a tonic for horses that is rubbed into the horses skin. The plant is rich in carotene. Water hyacinth seeds stay viable up to 30 years. 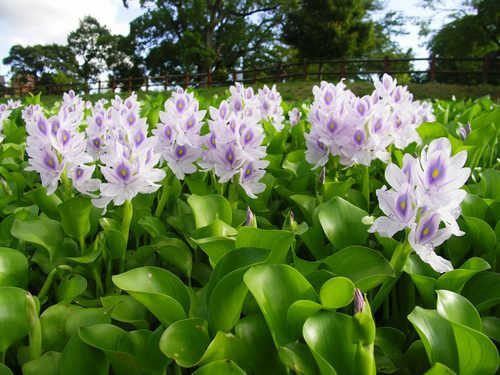 Water hyacinth is used in perfume and cologne products. It can be used as organic fertilizer and animal feed. It can be processed to make paper, rope, handbags, even furniture. It absorbs lead, mercury, and carcinogens when used for remediation purposes. Because of its amazing biomass it can be used to create fuels! 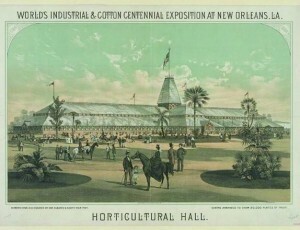 Water hyacinth is a great plant with an interesting history starting well before the Exhibition of 1884. Water hyacinth likely generates equal amounts of excitement and dread depending on who is dealing with it. The use of water hyacinth in water gardening will certainly not disappear overnight, but will likely become more of a regulated plant with limited distrubution; and understandably so. Those who choose to enjoy water hyacinth in their water garden ponds should be very careful on how they use them and dispose of them. Water gardeners should be especially careful not to release water hyacinth into local waterways knowing that a few plants could quickly reproduce to the point of covering and choking YOUR local waterways. Hello Mike, We are a school sponsored First Lego League team. For our project this year, we are looking at what humans in the future might grow for food on Mars. The Water Hyacinth caught our attention because it meets a lot of the criteria that would be required on Mars, such as; not needing pollinated, rapid growth, compact, and high harvest yield. 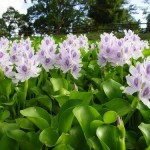 We have read that the water hyacinth is edible when cooked, but causes irritation if eaten raw. Do you know what exactly in the hyacinth causes the itch? We were thinking that maybe future agriculture research could create a hyacinth hybrid that is more palatable, nutritious, and frost resistant. Although we had better not let a frost-resistant hyacinth escape the lab. Any wild ideas about what more edible species might readily cross pollinate with the hyacinth? Swiss Chard? We live in Florida and there are muck issues (sewage) with the Indian River Lagoon. This river is a mixture of fresh and salt water, though the fresh water is more prevalent today due to stormwater runoff. The runoff creates more problems due to too much phosphorus and nitrogen, which creates excessive algae and phytoplankton. Would water hyacinths survive in this mixture of fresh and salt water and would they be an effective cleaner for this river? Naturally, they would have to be contained in a netted area, perhaps moved from section to section as needed. We have dolphin and manatees in addition to fish in this river. Would the hyacinth present a problem for them? Hi, my water hyacinth leave edges are burned, i keep them in european turtle tub and they are having new leaves and roots. I got them this week so i thought they might have been adjusting to the new water chemistery. Also i keep them in full sun for at least 5 hour a day. Temps here is 32c to 35c.any advises? Just as a warning, my small pond became overrun with water hyacinth this year. (lots of rain and high temps seems to make them spread like wildfire) and I lost almost all my fish. The guy at my pond store said it probably was the hyacinth depleting all the oxygen. I was devastated to lose my fish. Three of them were over 5 years old and had gotten really large and pretty. 🙁 I wish I had read this at the beginning of spring, but thank you for the information. Our pond water is a little ‘dirtier’ than usual this year and I’m just curious if rinsing the roots of the hyathcinths I am keeping when weeding some out will help or if the culture around the roots is beneficial to the water quality? I have a 500/600 gallon pond with about 40 goldfish. A package of three hyacinth just arrived. Do you recommend growing them on the surface or using a container with soil and topped by river rocks and putting each inside a container perhaps limiting its capacity to expand. I am having trouble with string algae that looks like it is killing the roots. Have been manually combing it out, but the roots are black and dead. The algae causes the roots to float and it looks bad. Something is amiss. How can I keep string algae from suffocating the roots? Thanks. Our local government in the Philippines is spending much money to give ways of the clogged water hyacinth. Your inputs is of great help for all of us and open a potential industry. I purchased several Hyacinths this spring. Now I have about 50-100 small fish in my pond. They are not Koi as I do have Koi and am familiar with their offspring. Any ideas as to what kind of fish they may be? Do Hyacinth plants produce oxygen for fish. Will Water Hyacinths grow in dirt , and not in the pond? They are so pretty that I hate to trash them and if they would grow in my landscaping, I’d be happy. My 7×8 ft pond has an abundance of hyacinths and Lilly pads so I pull some out every spring. This year I realized that the roots are filling up my pond even though I keep the top only half covered by the plants. But ever year I keep losing about an inch of water a day, even after I put in a new liner a few years ago. Before tearing it apart again to find the issue I wondered it either of those plants were actually ‘drinking’ up my water since I have so many roots in there? My Lilly’s were in pots in there but have grown out of the pots years ago, too…. Hyacinths in my pond are not doing well! Turning yellow. They are in full sun. Should be thriving. Hi! I have a pond with water hyacinths growing very well. I took a few and placed them in my 55 gallon aquarium with a plant light. They keep the water crystal clear, but the leaves are turning brown. Should I try a different type of light? Yesterday I added four Hyacinths to my pond. This morning it seemed that the Racoons had eaten all of them. Any tips dealing with racoons please let me know. Is there anything which would naturally choke out the water hyacinth? Hi! We are wondering if there is a leak in our round 13’x3′ deep water garden. No pump or plumbing issues, no waterfalls, but was curious if too many plants can use up water and make it seem to be a leak. It got quite full of large water hyacinths, but we removed them to start searching for possible hole in liner. There were other plants as well. I found the best way to keep the roots from breaking off and fouling the water is to tie a fine mesh bag to the bottom of the plant, over the roots. This also seems to slow down the spreading to almost zero. The bag catches the broken off roots, and just needs emptied about every 1-2 weeks. I have no problems with the dead roots fowling the filters, and it seems to have no effect on the plants. You do need to trim any roots that grow outside the bag when emptying the bags. The fish can not nibble on them, but not for lack of trying. If I could find some fine black mesh, this method would be perfect. The white mesh bags are obvious in the water. Hi Mike, after the first frost, what is the proper way to dispose the hycinths? I have a small pond all cover with them and after reading the article, I am worry to throw them in the green bin. I just want to thank you for this informative article. I especially enjoyed the history of this invasive yet convenient for my koi pnd plant. I live near Buffalo NY and buy about 6 each year for my approximately 15′ × 15′ plus pond. Typically by August I am removing between 50 and 100 of them a day into my computer bins. This year has been very odd, maybe due to the excessive heat, I only have made 30 of them in my whole pond. Good for me not having the task of thinning the out, bad for my compost. Thanks again. Do you know where I can offer them for free. My pond is overflowing. I live in zone 7 and we line in newport news, va? Some of the bulbs look like a bite has been taken out of them… Would a deer eat these? Or is it a disease in the water. Does the water have to be of a certain temperature. I live in a zone 4 and have 7 of them in my above ground pond. The bottom leaves are dark brown. They don’t look as healthy as when I bought them. Do you have any suggestions on what native plants to use instead of water hyacinth? In Wisconsin it is illegal to possess this plant so I would like to learn some alternatives. 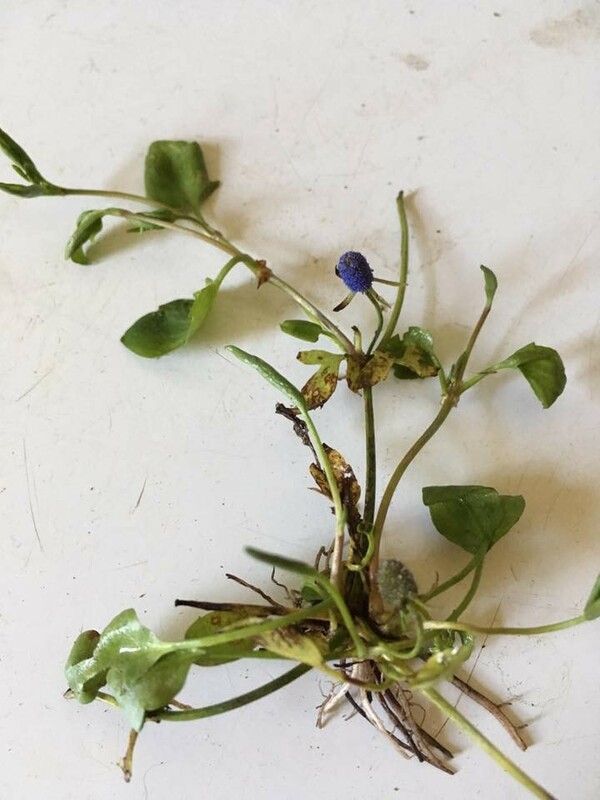 Is it true that this water hyacinth plant uses up large amounts of oxygen from the water depleting the fish oxygen supply? 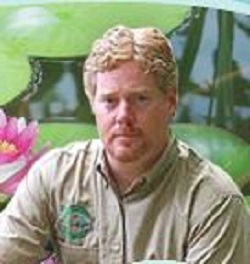 I have a small 120 gallon pond and plan on thinning back the plant frequently but after I put it in I found an article claiming that the plant actually starves fish of oxygen( can even kill then) even though it is a great bio filter. Thoughts or input much appreciated. Can I bring them in and leave in a water tub? I hate to throw them out as they are hugh and beautiful and healthy. Have large hyacinths and can they stay in pond for winter in Illinois? Thanks for the great tip on composting the overgrowth on these fast reproducing aquatic plants. The floating ring is very helpful when trying to control these plants in the water garden. Last year I put the water hyacinth in a floating netted ring which kept it contained in my pond, Some koi wanted it so much they jumped into the net. I add all of the over growth into my compost almost daily. makes a great addition to compost. Its great to cover part of the pond for shade for the koi in the super hot summer .in Maryland .